CHARLOTTE – The University of North Carolina’s Board of Governors opted Friday to eliminate an academic center concentrated on poverty and run by a controversial professor. The Board of Governors, meeting on the campus of the University of North Carolina at Charlotte, voted unanimously to accept recommendations to shut down three centers on three different campuses – the Center for Biodiversity at East Carolina University, the Institute for Civic Engagement and Social Change at N.C. Central University and the Center on Poverty, Work and Opportunity at UNC-Chapel Hill. 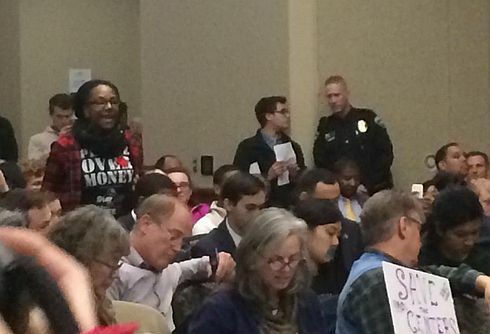 A student speaks up in protest at Friday’s Board of Governors meeting. Student protestors, who came to the meeting in Charlotte from several different campuses, nearly shut down the meeting. The five-month review of centers and institutes, conducted at the behest of the Republican-led state legislature, looked at 240 centers on the 16 university campuses in the UNC systems. The university system leaders may opt to further evaluate nine marine science centers at various UNC campuses at a later date. The resolution passed Friday makes clear that the three centers singled out for closure will be shut down by this summer and negates an effort, largely led by UNC-Chapel Hill faculty, to urge Chancellor Carol Folt to keep the poverty center open. Folt told the UNC Board of Governors that many on her campus view their actions as an attempt at suppressing academic freedoms. “They’ve very fearful this decision [will have] a chilling effect,” Folt said. UNC Board Chair John Fennebresque called for a recess and then moved the university governing board’s meeting to a smaller room to hold its vote on the future of centers and institutes, keeping out students and other members of the public from coming in. Members of the press were allowed into the meeting room, and audio and video of the meeting was streamed to an adjoining room to comply with open meeting laws. The elimination of the Poverty Center, in particular, brought accusations from faculty, students and others that it was an attempt to silence Gene Nichol*, the director of the Chapel Hill poverty center, who has rankled Republican leaders for his newspaper editorials lambasting largely Republican politicians for policies he attests ignore the plights of the poor. All of the 32-members of the UNC Board of Governors have received appointments from a state legislature dominated by Republicans. 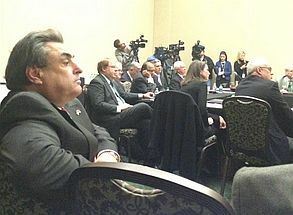 N.C. Sen. Bob Rucho listens Friday to the UNC Board of Governors discuss closing down three centers. State Sen. Bob Rucho, a powerful Republican from Mecklenburg County, was at Friday’s meeting and told N.C. Policy Watch that he attended because the university’s board of governors was meeting near his district, and not because of the vote on centers and institutes. In recent years, groups like the conservative Civitas Institute, funded largely through former state budget Art Pope’s family foundation, have urged lawmakers and the board of governors to shut down Nichol’s poverty center. The Civitas Institute attracted attention last year for its 2013 public records request to review thousands of Nichol’s emails and correspondence. In a statement issued after the vote, Nichol , a tenured law professor, said that he has since been approached by other funders to create a poverty research fund at the law school to continue his work. Nichol did not attend Friday’s meeting. Hannah Gage, an emeritus member of the UNC Board of Governors, told the board during Friday’s meeting that voting to eliminate specific centers at campuses was a worrisome departure from previous boards that left chancellors and trustees to make campus-level decisions. “We are crossing a new line when we make these recommendations,” said Gage, who serves in an emeritus capacity on the Board of Governors, and is not a voting member of the board. Centers will also need an annual review on the campus level, with a more comprehensive evaluation every five years of all centers. It also reiterates existing university system policies on advocacy and political participation limits. Jim Holmes, who chaired the group reviewing centers, said that though the three centers singled out for elimination may align with liberal policies, that wasn’t the intention. And when asked the specific reason why the poverty center was eliminated, Holmes responded that it wasn’t what the academic centers did, but that the trio slated for closure didn’t lend to having a stand-alone center. “They didn’t need a center structure to exist,” he said. Note: Gene Nichol served on the board of the N.C. Justice Center, an anti-poverty non-profit that N.C. Policy Watch is a part of, until the end of 2014. Nichol had no role in the reporting or writing of this post. So, the BOG didn’t object to what these centers did and we are supposed to believe the Board went through all of this just because they thought the “structure” of a center was unnecessary? We know it wasn’t about money; there wasn’t any at stake to speak of. (No state money involved in the Center for Poverty, Work and Opportunity.) But the BOG still reached down and interfered in the decisions of individual campuses to eliminate these three centers, even though there was no fiscal reason and supposedly no objection to the work being done. The only reason left standing seems to be to discourage the state universities from working on issues the Republicans are hostile to – civil rights, voting rights, the environment and advocacy for people in poverty. Gene Nichol is “controversial” ONLY insofar as Art Pope and his numerous supporters don’t like him. I like that, I see you are pre-trolling. I guess you are having a hard time waiting for my insightful comments. And woohoo! Jonny Edwards’ crony project is off the government teat. Great posting Smackdown ! ML’s pre-troll comments are about as “insightful” as his post comments. Stopped you from ranting your normal propaganda nonsense about everyone and everything that threatens the conservative brand is deemed communist, unamerican, or anti-freedom. Ah, yet more “insightful” comments from Team Civitas employees. What is it that scares you so much about this site that you feel it necessary to be our resident trolls? oh, you mean the insight that Nichols hired his goons to troll the BOG meeting? but that is evident from the picture above. The picture of the African American student standing up is evidence that he has hired “goons”? Better watch your step lsd. I never have understood what the poverty center did except give edwards a job for awhile. I have never seen any reports, papers, etc that study poverty. The bog is right that you do not need a free standing clinic to study. Poverty is everywhere, even in orange county. I am concerned about the bio diversity group-that I think has a legitimate role research possibilities. I am not stepping on anything, just relaying the information. Whether I agree or not….that is up to you to figure out.